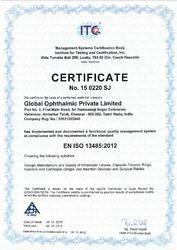 Our organization, Global Ophthalmic Pvt. Ltd., an ISO 13485:2012 certified company came into being in the year 2009, as leading manufacturer, exporter, supplier and wholesaler of exclusive range of Lens and Tension Rings. 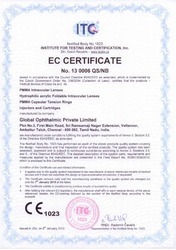 We gained a reputation of deliverance and trust within the industry due to our unfaltering excellence in producing the most efficient products including Hydrophobic Aspheric Intraocular Lens, Hydrophilic Yellow Acrylic Foldable IOL and Hydrophilic Square Edge IOL. We make excruciating efforts to ensure complete client satisfaction by providing customizable solutions for their practicing needs. To keep the superior quality, our products are manufactured under the direction of experts, who have rich industrial experience. Moreover, in order to offer the optimum quality of products, these are inspected on dissimilar quality parameters using sophisticated techniques. With our own brands Accura vue, Aspro Lenz, Hemafold, Proxy Lenz, Glowedge and Glowvision we meet the constantly evolving requirements of the ophthalmic surgeons. In addition, our moral business policies, honest dealing, reasonable prices, optimum quality of products has helped us in exporting our products all over the globe. Our infrastructure is our stronghold, wherein all the departments of our organization are situated. Our campus houses structures that facilitate for working space, segregated into departments. Each department in our organization houses employees adept in their pertaining field, who work round the clock to ensure impeccability in production. We make use of high-tech machinery that is precision controlled using modern software to manufacture our products. Our products are made using the highest quality raw material that go through calculated checking procedures to eliminate redundancies. We are assisted by experienced professionals who are experts in their respective areas. We have established a spacious warehouse that is equipped with all required facilities. Moreover, our flawless transportation facilities assist us to supply products to clients within the shortest possible time frame. Under the mentorship of our esteemed Marketing Manager, Mr. Kamban, we envision our organization at the pinnacle of success. By providing the highest quality of Lens to our clients, we strive to continue on our stride towards absolute customer satisfaction. Manufacturing, Trading, Importer and Exporter of Lens and Tension Rings. Our organization is segregated into various departments that are adept in particular tasks of production as per specialization. Our facility incorporated R&D, physicochemical lab, Microbiology lab, Production, Quality Control, Packaging and Sterilization in a single roof. Our Intraocular Lenses are manufacturing with NANO resolution CNC air bearing Lathes and Tumble polish Technology under controlled environment and Final quality Control and packaging under class 100 workstations in class 10,000 ultra modern clean room facility. Our warehousing division stores all our equipment in sterile environments to avoid all contamination before reaching the client. 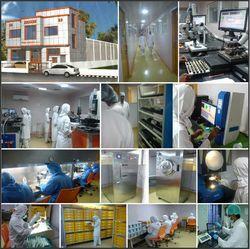 Our manufacturing capacity is approximate 1.2 to 1.50 million IOLs per annum. Now we are manufacturing 700,000 PMMA IOLs and 300,000 thousand Hydrophilic acrylic IOLs per annum and expanding our facility for manufacturing of hydrophobic IOL's. Being a quality conscious enterprise, our sole objective is to offer only the best quality products to our clientele. We have achieved a well-known position in the industry due to our precisely engineered Lens and Tension Rings. In order to manufacture these products, our professionals utilize only the finest quality raw material that is procured from trustworthy retailers of the industry. Also, they rigorously examine these products on well-defined parameters of quality to assure the quality and long working life. We contribute to the improvement in the quality of sight, and therefore the life of patients. Serving the world of ophthalmology, we design, manufacture and market innovative interocular lenses, responding to the strictest requirements in quality. As a team and as a partner, we value pro-activity, authenticity, respect, collective intelligence and engagement. We work alongside professionals in various specializations within the industry. Each employee within our organization is adept in his work and has the technical know-how in his field. We proudly associate ourselves with professionals in domains of research and development, medicine and healthcare, and business management amongst a range of others. We continually progress through skill development by conducting seminars and workshops to improve our pace and quality of services to our clients. Well-versed with their respective domains, our team ensures to fulfill the exact demands of customers in efficient manner. We ensure all our products are free from contaminants while maintaining accuracy and functionality of our product. We make all our equipment safe for practicing with an assurance of trust. Our ethical business dealings along with humble associations make us an ideal business associate.